This book contains the U-boats situations and trends written by the staff of the Admiralty’s Operational Intelligence Centre during the Second World War. 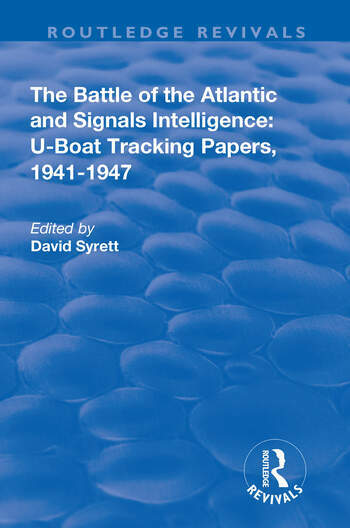 Based largely on communications intelligence, the U-boat situations and trends were designed to inform a small number of senior officers and high officials of the latest events and developments in the Allied war against the U-boats. The Battle of the Atlantic and the war against the U-boats was the longest and the most complex naval battle in history. In this huge conflict which sprawled across the oceans of the world the U-boats sank 2,828 Allied merchant ships while the Allies destroyed more than 780 German U-boats. These documents relate on a weekly, and in some cases a daily, basis exactly what the Allies knew concerning the activities of the U-boats during the Battle of the Atlantic. David Syrett was Distinguished Professor of History at Queens College, City University of New York in Flushing, New York and a widely respected researcher and documentary editor on eighteenth-century British naval history and the Battle of the Atlantic during World War II.